Police draw up their lines at the May Day protests. Photograph by Burak Kara. Used with Permission. 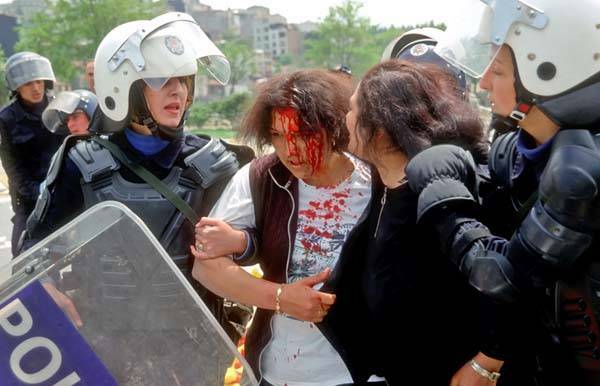 “Mayday celebrations in Istanbul, Turkey were again marred by police violence and attempts by the authorities to prevent demonstrations from going ahead,” Amnesty International declared in a statement released today. [Turkish version of the statement is available here]. 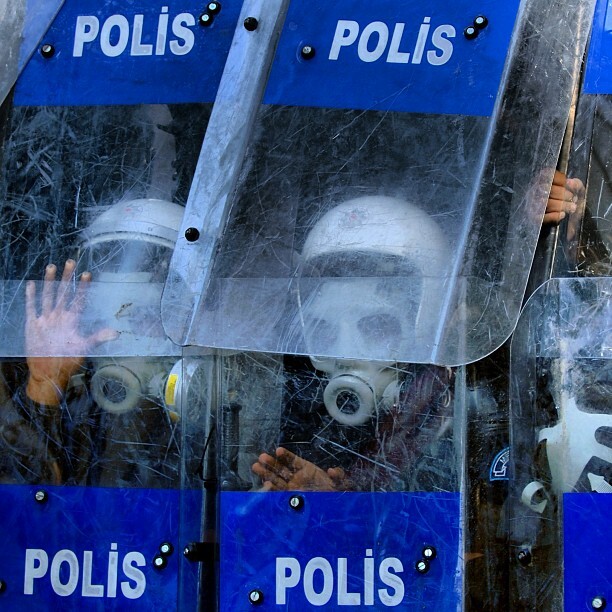 In truth, vast sections of Istanbul looked like a war zone, as authorities closed down public transportation and security forces employed water cannon and tear gas against peaceful protestors. It was unclear what legitimate purpose could have been pursued by police in their use of water cannon against peaceful demonstrators and those leaving the site of demonstrations. 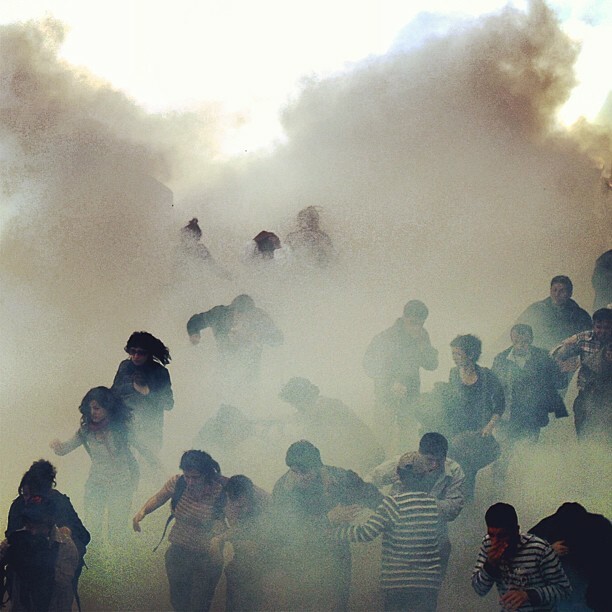 Amnesty International is also concerned at reports that tear gas was fired into buildings, including private homes and vehicles threatening the safely of demonstrators and other members of the public. Scores of injuries were reported, including two separate incidents where demonstrators had been hit in the head by tear gas canisters fired by police. One, a 17-year old girl reportedly was in a coma for 24 hours as a result of the injuries sustained. Another demonstrator is reported to have lost the use of one eye, following being hit in the head with a tear gas canister. 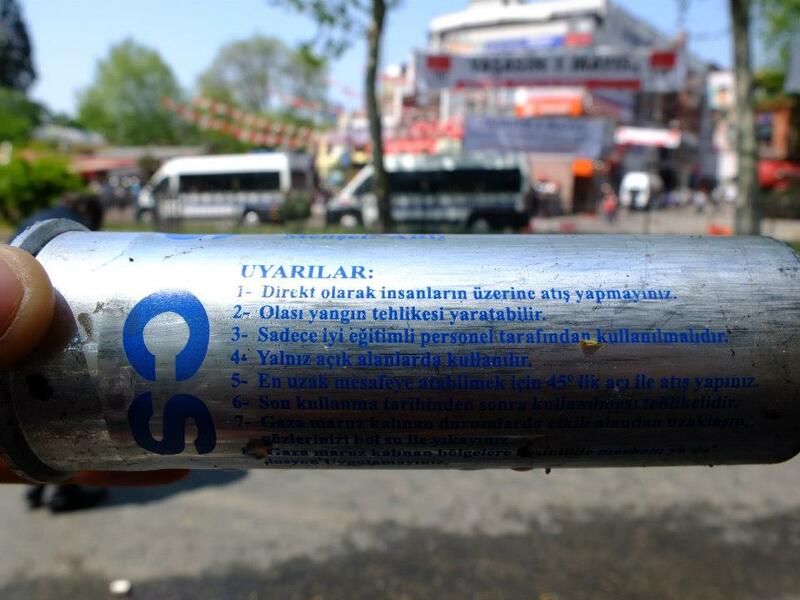 Gas canister used at May Day protests with directions not to aim directly at people. Individuals were hit in the head by such canisters. Photograph by Begum Bilginer. Used with permission. Amnesty International calls on the authorities to provide law enforcement officials with guidelines requiring that any use of force be proportional to the threat encountered and in line with relevant international human rights standards. It further calls on the authorities to conduct a prompt, independent and impartial investigation into allegations of excessive use of force by police officers. Demonstrator injured during May Day protests. Photograph by Ali Oz . Used with permission. There is a disturbing pattern here: Middle East Technical University, Emek, and now May Day… With startling regularity, peaceful protests are met with overwhelming police presence and unexplained limits on the right to assembly. With startling regularity, there is evidence of excess of force being used and no investigation in the aftermath. Turkey can and must do better. Author’s note: I am grateful to Zeynep Turkyilmaz for her help in contacting the brilliant photographers who recorded these events. I am even more grateful to the photographers themselves, who so generously allowed our use of their work here. This entry was posted in Amnesty International, Excessive Force, Freedom of Association, Freedom of Expression and tagged Amnesty International, Emek, Emek Sinemasi, excessive force, Freedom of Expression, gas canisters, impunity, May Day, METU, ODTU, peaceful protestors, Police violence, Right to Assembly, tear gas. Bookmark the permalink.